Q: Reporting America at War examines a century of war correspondents. It's a timely subject, certainly, but not something that immediately comes to mind. How did you come to be interested in the subject? A: The war correspondent is an archetype, after all. It has been a mythic persona throughout the 20th century. Not just Joel McCrea in the early days of Hollywood, but also the trench coat, the vest and the flack jacket  its an image that has become part of the national identity in a way. So I felt there was a character here that needed to be further explored. I began to read the work of people like Ernie Pyle and Martha Gellhorn and I was struck not only by their remarkable perspective on war, but also by the writing, it was more than just journalism, it was an extraordinary body of literature that really grappled with the reality of war. So I thought that war correspondence might be an interesting way to look at American history, as well. Q: Are there broad themes that you explore in the film? A:	Ultimately, it's really a film about how we as a nation understand war, how the conflicts of the last 100 years have been remembered and recounted and understood. That's its primary thematic arc. The film also traces the changing shape of the the media in this country, its evolution from print to radio to television to the Internet, and the impact of those shifts on the way war has been reported. As it has grown and changed, the media has engaged in a complicated dance with the Pentagon and the military. And in a very basic way, the relationship between reporters and generals  often collegial, at times antagonistic, always co-dependent  has really defined the way the wars of the last 100 years have been perceived. Finally, it is a film about the unique place of the war correspondent in our culture, and the extraordinary challenges inherent in their attempts to communicate the meaning of war to the rest of us. So the series operates on a number of different levels. It's a complex and often turbulent story and it doesn't resolve simply or clearly. It leaves many complicated issues up in the air. But I think that's healthy. It's provocative, and it makes us think hard about what it means for a democracy like ours to go to war. Q: You chronicle the changing relationship between the Pentagon and the press, with particular emphasis on the tipping point when the press became less of a cheerleader and more of an adversary. Was there a seminal event that made that change? A: You know, the media is, to one degree or another, always reflecting the views of the culture that they're part of. There's this myth that we have this vast, liberal media out there. I believe that the media is quite a conservative institution, by and large. The press doesn't like to be too far out ahead of the story. It tends to reflect public opinion more than lead public opinion. So I think it's not surprising, when you look back on the first 50 years of the 20th century, to see the media very much "on the team," to use the World War II phrase  very much supporting the government's call to arms and rarely questioning the rationale for war. You see this in the Spanish-American War. You see it in World War I. You see it to a great degree in World War II. But, clearly, the Cold War and Vietnam were the defining events that ruptured the hand-in-glove collegiality that had existed between reporters and the soldiers they were covering. And I think that if there is a watershed moment, it's the Tet offensive in Vietnam in 1968. It's the moment when the press, again, didn't lead America, but reflected America's ambivalence and uncertainty and impatience with the war in Vietnam. There certainly had been skeptical reporting before Tet, but it was the exception that proved the rule. After Tet, the press felt much more comfortable airing the doubts and ambivalence that the country so clearly harbored about the war. It was the reporting from that period and the years that followed that gave rise to the myth that the press lost the war in Vietnam, which in turn triggered a backlash against the media that has played out in Panama, Grenada and the various wars we've had in the Persian Gulf. Q: Like all great stories, this is in many ways a story of some remarkable personalities. You reintroduce viewers to the Murrows and the Cronkites and the people that are familiar, but you also introduce people to relatively unknown reporters like Martha Gellhorn and Homer Bigart, people that had a profound impact. Can you talk about some of these figures and what stories they tell? A: I was struck by the way all of these wonderful characters kept appearing and reappearing in all the conflicts of the 20th century. That's one of the reasons I felt it would make an interesting film, because it was this biographical relay race. Martha Gellhorn is in the Spanish Civil War, and then she reappears in World War II, and then she shows up in Vietnam. These people kept bumping into one another. It's a great narrative device to follow them along. But what struck me about them was their ability not only to be brave  because it took tremendous guts to do what they did  but also to really bring the idea of war home to their audience. You can't really understand what it's like to be a war correspondent unless you read Martha Gelhorn's extraordinary reporting from Spain; unless you have read Ernie Pyle's deceptively simple dispatches from North Africa; unless you understand the impact of David Halberstam's provocative reporting from Vietnam. They had an ability to communicate not the reality of war; but often the total fog of war, the complete chaos of war, the horror of war, in a way that made them invaluable to us. That's what intrigued me about them. Q:	What is your take on what drives these unique people? A:	I think they are driven by a complicated mixture of impulses: fame  the lure of celebrity is, unfortunately, an increasingly powerful aspect of the job. But I also think many of them are really determined to confront what they see as inequality and injustice in the world. Homer Bigart is a classic example of this. He was a person who felt, as David Halberstam says in the film, that there were a lot of cruel people in the world who had done a lot of very cruel things; and that one of his jobs as a reporter was to "shine a small light" on that cruelty. Great war reporters need to have that moral purpose. They need to have that sense of commitment. Then again, the motivation may also be political. I agree with what Rick MacArthur says in our film, that political motivation is not necessarily a bad reason to go into journalism. You need a reason to put your life at risk. And I think some of the best journalism has come from people that have a passionate political point of view. Q:	Did you find in doing this film that there was one figure that was the most compelling to you? A:	I'd have to say it was Ernie Pyle. Although he was "on the team," like most of the reporters of World War II, although he believed in the righteousness of the cause and in the censorship restrictions that he and every correspondent operated under, he had a unique genius. He had a way of taking these simple stories, these deceptively simple events, and making them iconic , making them deeply emotional, making them, I think, profoundly important to his country. There have been a lot of people that have tried to imitate Ernie Pyle's style, but I don't think anyone ever equaled his intuitive understanding of his audience. He knew exactly how much of the war he could really tell his audience, and he knew how to make his point without offending his readers and without reducing the complexity of the events in question. He got Americans to relate to and sympathize with the plight of the regular G.I. Joe, what he was going through, what sacrifices he was making for the people back home. I think that's what a great war correspondent does. Q:	Technology plays a huge part in this story, does it not? A: It is one of the primary thematic elements in the film. Just when the press has figured out its role, along comes some technological innovation, and they must reinvent themselves. You see it time and time again, as with Edward R. Murrow, who used language and his wonderful voice to transform radio into a medium that had never been used in that kind of way. What is interesting is the degree to which technology has not always been a positive development in the story. Clearly radio in World War II was a tremendous breakthrough that brought the war home to people in ways that they had never encountered before. But I think the impact of television has been a decidedly mixed blessing. In the case of Vietnam, both the Pentagon and the media overemphasized and, perhaps, overvalued the impact of television. I think the impact on the general public was not as great as observers thought it was. Studies after the war showed that the "Living Room War"  which supposedly brought the bloody sights and sounds of battle directly into people's living rooms  had very little impact on the way viewers felt about the war. Having said that, it was remarkable to see Jack Lawrence reporting from deep in the jungles with Charlie Company, or Morley Safer filming GI's lighting thatched roofs on fire with their Zippo lighters. This was revolutionary television, make no mistake about it, but its ultimate impact on the course of the war has been overblown. These moments were more the exception than the rule. Unfortunately, the ubiquitous, almost voyeristic nature of TV has led to the current state of affairs, epitomized in the most recent war in Iraq, where television has become the dominant force in war reporting, with 24-hour saturation coverage and the general superficiality of analysis that tends to go along with explosive pictures. As a result, I think the print reporters are beginning to write less well  they're beginning to lose the evocative quality that defines a good dispatch. How can you trump a live report from the back of a Humvee, riding through the desert? I think television, by it's very nature, highlights the sensational, what in Vietnam they used to call "bang-bang" footage. Thus the coverage becomes more general, less substantive, more patriotic and ultimately less satisfying. Q:	Do you think this last point was manifested in the Iraq war? A:	I think that's exactly where it was most profoundly visible. The embedded reporters, like all war reporters, see only a tiny sliver of what's going on. And, yet, because the whole concept of embedding reporters with these units was such a new idea, that became the big story. It became the equivalent of the smart bomb videos in the Gulf War, it was all anybody seemed to remember. And many of the embeds, you have to remember, were TV journalists  they were reporting live  and live coverage tends to the superficial. There's no time for reflection, or context or analysis. It's just a straightforward recitation of what's happening right now – without any sense of how it relates to the bigger picture or what it ultimately means. Q:	What would you like viewers to take away from this film? A:	I'd like them to know that we, as Americans, need to demand from our press and from our military as clear-eyed and honest reporting about a war as we can get; that, as Walter Cronkite says in the film, this is the most intimate commitment that we can make of our men and women, and we need to know how they're performing in our name. And I think that the press and the military, both individually and collectively, have let the American people down quite often since World War II, in the sense that the coverage often has not contributed much to our understanding of what war is. We have to realize that wars, like anything else, are packaged. They are spun. There is an image created for a war. And the press is a primary vehicle of that message. If wars are presented as surgical, as clinical, as casualty-free  it will change our attitudes about war. It will change our views about what it means to go to war. Whether you believe that what the Pentagon is doing in Iraq is a good thing or a bad thing, it has an impact. Both the press and the military have a huge role to play in determining what Americans' memory of those wars ultimately will be. And it's not just the role of the historian, in the end, to come and set the record straight. A great deal of what we feel about a war , a great deal ofwhat lingers in our collective consciousness is that first draft of history; that visceral branding, in effect, that is put on that conflict. And that is where the Pentagon and the press have a profound responsibility to the American people  to show, as clearly and as accurately as possible, what the true impact and repurcussions of a given conflict may be. Q: Reporting America at War was a five-year project. Was it a labor of love or at times just a labor? A:	It's actually been the hardest film I've ever made  much harder, minute for minute, than The West, because it covers so many thematic and biographical and historical strands. But it's also been one of the most satisfying. Little did I know over the course of the five years that when we were finally finished the subject of the series would be intensely topical again. We thought we would end the film with the first Gulf War, and events have proven us wrong. Now that we are in this place and this issue is in front of us again, it obviously means that there's a great deal of relevance to the story. In that sense, I'm hopeful that the important ideas that I think are in this series will find a broad audience and will resonate with people. 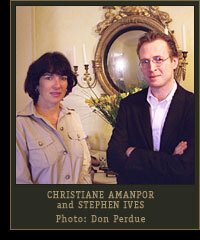 Q:	There will be a lot Stephen Ives on PBS this fall: Reporting America at War, the re-broadcast of The West. "Seabiscuit" just won a primetime Emmy. Where do you feel you are right now in your craft? A: I got a great leg up working with Ken Burns when I first got started in the business. And I think I've always been drawn to historical stories. That's what I love. And I think that's what I know. But I've also been attracted to telling contemporary stories. I did a film about the world's smallest opera company, the Amato Opera in New York, which is really a love story about two octogenarian opera lovers. I did a film about a traveling theater company called Cornerstone that did classic plays in the heartland of America, for HBO. And those stories resonate as much with me as historical stories do. My interest is to figure out a way to continue to make historical documentaries, but also to infuse them with a contemporary component. And I think somewhere in that hybrid between good history and good cinema verite filmmaking is an interesting movie. And that's what excites me, and that's the kind of thing I want to pursue. Q: Your interests certainly are varied. Is there a project out there you have your eye on down the road that you would like to do? A: Right now, I am working on getting Cornerstone its first national PBS broadcast, and I'm developing a three-part project for the American Experience series on the history of Las Vegas, which I think is a fascinating phenomenon as American cities go. It's an amazingly dynamic place, its not just Bugsy Siegel, the stories of the mob and the Rat Pack that we all know. It is also a kind of a window into where America is headed as a culture. Las Vegas is the fastest-growing city in America, and the most-visited place on earth. And I think it's an ideal subject to blend great historical and great contemporary filmmaking and make them come together in one dynamic package. Copyright © 2003 WETA. All Rights Reserved.